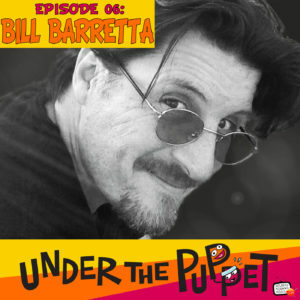 http://www.UnderThePuppet.com – Bill Barretta is the Muppet performer behind the characters of Pepe The King Prawn, Bobo the Bear and Johnny FIama. He also is the current performer for Rowlf the Dog, Swedish Checf and Dr. Teeth. In this interview we talk about his first job, his thoughts on creating characters and stepping into legendary ones, what his role as Puppet Captain/General entails and more. Also on the show, the next step of your Puppeteer Action Plan, a small action you can take today to help your puppetry career grow.